Shō'onkō Ryohō, born in Tan-shū (Tan zhou, Shandong province), was a traveling medicine-seller. He lived in Taiei-zan (Duiying shan) where he began robbing travelers, becoming famous for his use of a specific spear known as a hōtengeki. 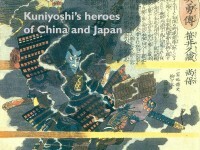 Ryohō fought a celebrated battle with Saijinki Kakusei, another user of the hōtengeki, over who should control the area of Taiei-zan. This battle continued for days until the panther's tails that were special ornaments for their weapons got entangled. Eventually, Shōrikō Kaei (Hua Rong) a powerful local lord urged them to stop fighting, shooting the tails with one arrow. This remarkable feat so impressed them both that later they became his followers. Since then, these two fighters are always depicted as a pair. 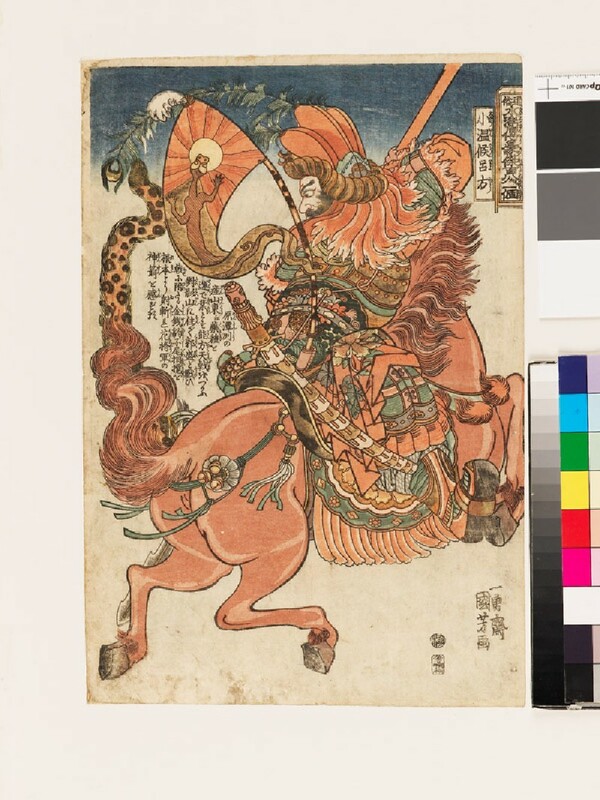 This print shows Ryohō in armour on a rearing horse, armed with his long spear and a banner with the insignia of a lizard. The print forms a diptych with that of Saijinki Kakusei (8) [EA1971.94].